In Mingun discover the stories behind a massive unfinished brick pagoda. Nearby, admire the un-cracked Mingun Bell and the stunning all-white Hsinbyume Pagoda. Optional Hot Air Balloon Flight - Between 01 October and 31 March, take a hot air balloon flight over the majestic temples of Bagan. Flights last approximately 45 minutes and must be purchased prior to your cruise to guarantee availability. Freechoice: Venture to Mount Popa, home to Myanmar’s nats or nature spirits. Alternatively, explore the markets at Nyaung U before either exploring the Temple Circuit, or enjoying a visit to Old Bagan. Travel by horse and cart through a local village then through the surrounding plain and it’s temple ruins before learning all about the production of Burmese lacquerware, a Bagan specialty. Later continue cruising downstream to Salay. On your walking tour of the town, explore Paya Thonzu, a small trio of brick shrines, admire Youqson Kyaung, a beautiful teak monastery and look inside the largest lacquer Buddha image in Myanmar. Dip your toes into the magic of Myanmar and cruise along the Irrawaddy river on the luxurious Scenic Aura, your all-inclusive home-away-from-home. 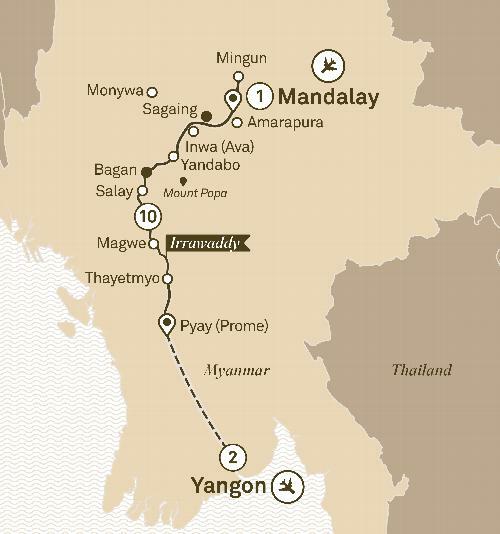 From Mandalay to Yangon, the sublime Irrawaddy River and equally enchanting landscape of Myanmar will accompany you on this adventure of a lifetime. Only recently opened to western travellers, this land of deep spirituality and spectacular treasures will entrance and delight. Scenic Aura will be your all-inclusive luxurious home-away-from-home. Experience traditional river village life in Yandabo, let the awe of Bagan wash over you and explore the colonial relics of Thayetmyo and Salay before arriving in the bustling capital of Yangon. The city offers up many surprises including a thriving arts scene and the spectacular Shwedagon Pagoda. As the sun sets on an incredible experience you’ll take part in a traditional oil lamp lighting ceremony, an uplifting and magical way to conclude your time in this mystical land.